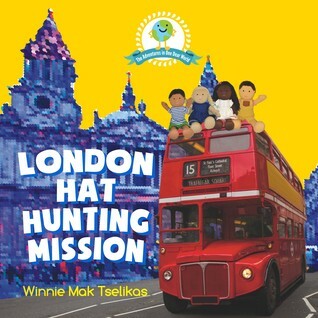 Thank you for the support from our backers and friends, our book launch party was held at Holborn Library on 18th November 2017 and our first children's storybook London Hat Hunting Mission is now published! We had a great time celebrating London's cultural diversity at the party and we wish to have more guests from different cultural background in our future events! Thanks my mum Connie for coordinating the doll samples, giving suggestions for doll improvement, offering her beautiful collection of London photos for my book and more, my mum-in-law Effy for giving feedback on my book and taking care of Alex so that I can focus on the work, our (un)official photographer Elly for offering her utmost support each time I need help, my BFF Shelly for her support as always and the very thoughtful OneDearWorld necklace (love it!) and all my families, friends and supporters who backed One Dear World crowdfunding project earlier this year. Last but not least, my hubby Rafael who constantly push me out of the comfort zone. It's not a pleasant experience a lot of time but thanks for that! Let's grow together and more importantly grow old together ! Our backers will start to receive our book from end of last week depending on the shipping destination. For those who haven't got the book beforehand, don't miss the opportunity to win a signed copy and enjoy the story with your little one during the holiday! Enter the giveaway below and spread the love by sharing it with your friends and families!